I’m wearing my “Pod” dress, layered with my "Tiny Tim" top, a Comme Des Garcons jacket in black wool gabardine, and Jil Sander black lace-up boots. Probably when I was a little girl. I started sewing when I was about 4 or 5 years old. I would sew dresses for my little dolls with the scraps from my mom’s sewing table.. I'm very inspired by my customers. They're extremely diverse and dynamic women who are involved in all walks of life. They are the people who make things happen. They may not be the most famous people who get all the publicity, but they are the people who are the vice presidents, the heads of production, the best doctors, the best dance choreographers, etc. Women are still a very unsung force in this country, but they very much inspire me. 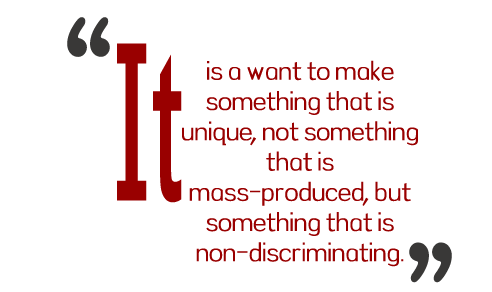 It is a want to make something that is unique, not something that is mass-produced, but something that is non-discriminating. My designs are an alternative for a professional woman to look well-presented, while also feeling creative and comfortable. Describe a few of your collection’s staples. The “Italian Widow’s dress” is a take-off of the house dress. I used to live in Greece and I became very inspired by the concept of this wearable dress that has a classic shape and nature, but anyone of any age group or figure type could take it and make it their own. It does take an interesting woman to translate this dress. The dress doesn’t make the woman; the woman makes the dress. My skirt pants are a very comfortable way of wearing a pair of pants for a woman.� It can look bulky if you combine both of those separate pieces, so I have transformed them into one item. It's kind of a classic look for me. Both of these pieces are outside of the fashion realm. They're not trendy pieces; they�re my own staples. What do you think attracts customers to your clothing? I have really good people who sew the pieces and who are involved in the whole company, so I think intrinsically you feel that when you put on one of my garments. When people care about the garment they sew, it comes through in the garment itself. When my customers go out in one of my pieces and get compliments, it’s because they feel good in what they’re wearing. I've always had an affinity for the dress. You can layer it, you can just throw it on. I like working with the dress as a daytime piece. It's versatile, and it can be very comfortable. It’s an easy piece. Sportswear has evolved so much, but the dress is timeless. I would say non-discriminating. I just feel like there is a lot of trying to categorize fashion, and ages, and body shapes, and putting things into stories, and I'm not interested in that kind of labeling of people anymore. I came from the fashion industry, and the more I study it, the more I think it needs to be updated. In the past 10 years, how has your personal style evolved? I would say it has gotten more free, and less fashion-driven. I am in the process of trying to break out of the mold that the fashion industry has set up. What is your idea of great style? Great style lets the person's spirit show in a physical way. What is the message you would like your clothing to communicate to women? I would like my clothing to be a very playful, positive experience for women to have a way of feeling comfortable with themselves. My customers will say, “Every time I wear that dress, people stop me on the street.” It’s not the dress itself, it’s the way they wear it. They feel good in it. Their light shines in it. They feel like they can go any place in it and they can be themselves in it. I want to make women feel comfortable and not boxed in. I want them to feel comfortable in whatever they do.